Welcome - How can I help you? As an experienced Psychotherapist, I understand that therapy is often the first opportunity you might have had to talk to someone who is not part of your family or a friend. Psychotherapy and Counselling, can offer a way in which you can explore issues face to face and this is where I can offer you a supportive, non-judgmental and confidential space to do that. I have helped my clients to explore and understand many diverse issues that are troubling them such as anxiety, depression, stress, relationship issues, feeling sad, panic disorder, family issues, separation & divorce, post-natal depression and grief. I usually suggest an initial assessment of about 60 mins, where we explore key issues that you might wish to address during your therapy and look at any concerns you may have. This provides me with a sense of what you are looking for from therapy, and allows you to ask me any questions. After our initial session, we would probably meet weekly, usually at the same time and day of the week, for a 50 minute session, but this can be flexible. It is worth noting, that entering into therapy is a commitment of both time and money, and that needs to be considered before working together. However, I am also available if you wish to have just a few sessions for immediate help during a crisis, allowing you to decide if you would like to enter into therapy more fully, over some weeks or months and even longer in some cases. I work with each client as an individual " to help you to understand your own life and hopefully to live it in a way that is right for you"
Why are you considering counselling - Anxiety, Depression or Stress? Struggling with our feelings or with patterns of behaviour is a part of life, that can make you feel sad. You might be having difficulty in avoiding painful feelings and experiences but you can choose how to deal with them. Counselling can help you in trying to understand how to respond to your own life experiences. Psychotherapy is particularly helpful when you are feeling stuck or overwhelmed and unable to make sense of these feelings. Seeking help from an experienced practitioner like me, means you are taking the first step to a more positive outlook and better future. 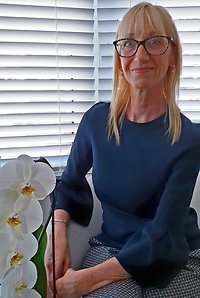 I have many years of experience in working with my clients in using both Psychotherapy or Counselling, for issues such as - anxiety, depression, stress, anger, feeling sad, relationship issues, separation, infidelity and divorce. Relationship counselling can be so effective if are you experiencing difficulties together as a couple - this can be particularly helpful when entering into a new relationship, during a marriage breakdown or if your relationship is coming to an end and are considering a divorce. I have experience in working with couples who would like to have counselling together. I am able to work with you and your partner if you are looking for a conclusion to a particular relationship issue for you both as a couple. I have experience in mediation between couples which can be helpful if you are stuck with a particular problem that you have been unable to resolve. Couples counselling within a relationship or marriage can be a really effective long term solution, if children are involved and is often the way forward to a better relationship between you both as couple and for your family. "Whatever issue you choose to bring into the counselling room will be respected and explored sensitively, at your own pace"
Perhaps you are experiencing feeling sad or anger with a particular issue in your life, then counselling could be the way forward for you to address these problems. Counselling is particularly effective shorter length of treatment for anxiety or panic disorders that have become habitual or need immediate help with overcoming and can be addressed whilst offering you insight into your lifestyle and the challenges that it can create. These difficulties can be addressed whilst working together on how to improve upon these for better long term outcomes, leading to a happier and more fulfilled lifestyle. A recent client after some months of therapy with me said - "I would just like to thank you again Sarah! You are fantastic and have helped me so much at a difficult time "
Counselling with me can be particularly useful for stay-at-home mothers and addresses feelings associated with isolation and lack of self-confidence. It can be useful to talk to someone about feelings of low self-esteem after having children along with the possiblity of returning to the workplace in the future. "I was at my lowest ebb, with zero self-confidence and didn't recognise or know myself anymore. As a stay at home mum I felt isolated and insignificant. I was very sceptical about seeking help, but it has proved to be the bravest decision I have made. Sarah was a safe haven of understanding and more importantly, she was really easy to talk to. Thank you Sarah"
Psychotherapy can be used to look in depth at issues from the past that are perhaps affecting life in the present, which can create a feeling of anxiety. Working in a longer term psychodynamic way, therapy can help to bring about a change which in turn can lead to long term resolution and clarity. It is a more detailed way of helping you explore issues that are impacting upon your life working together usually takes some months or longer. As an Integrative Psychotherapist and Counsellor, I have experience in a Psychodynamic approach to work with my clients and their issues that would offer a positive change after a longer term of therapy, usually over some months or even years. Please do feel free to contact me in confidence by phone 07791 166 056 or click here to email me if you have any questions about my service, without obligation. I am always happy to discuss how psychotherapy or counselling can help you. I am a Registered Member of BACP, British Association of Counselling & Psychotherapy and I work to a high standard of professional excellence, abiding by the BACP ethical framework for good practice. I engage in regular professional supervision as part of the BACP requirements and attend additional CPD (Continuing Professional Development) training courses on an on-going basis.